Glamour model with shiny gold jewelry, volume hair. 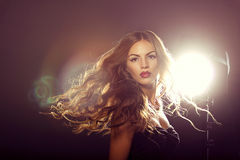 Portrait of luxury fashion woman with glamour gold necklace and bracelet, brunette curly hairstyle on beige background. Jewelry and Beauty Fashion accessories. 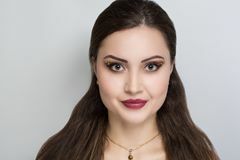 Model with chic lips make-up Model with curly hair Beautiful fashion woman with long straight hair Attractive woman with beautiful hair Glamour Beautiful Woman with Long Bride Skin care beauty woman Close up fashion model girl portrait with long blowing hair.